Canoe, camp, and cabins on the Mohican River. Provides river conditions, photos, and contact information. Located in Loudonville. Canoes, camp, and cabins on the Mohican River in Loudonville, North Central Ohio. Offers primitive and full hook up sites, and cabins. Includes area activities, rules and regulations, and directions. Located in Loudonville. A family campground catering to considerate families, scout and youth groups, with a special summer horse camp for children. Posts services and events. Located near Mohican State Park and Forest. Horseback riding and lessons, remote vacation cabins, camping cabins and camping facilities for organizational groups. Posts photos, directions, maps, and contact information. Located in Jackson County. RV and tent camping. Located in Loudonville. Posts services, rates and maps. Nestled in a rich wooded valley complemented with two stocked lakes and a small feeder creek. RV and tent sites and lakefront cabins. Provides directions, area information and charges. Tent camping, cabins and RV sites. Posts rates, local attractions, directions and trail information. Located in Phelps. RV, tent and cabins facilities. Amenities include pavilions. Enjoy hiking and biking. Located West Barnet. RV and tent sites and lakefront cabins. Provides directions, area information and charges. Located in Sautee. Full hookups plus cable, level concrete slabs and cabins for rent. Photo gallery and directions. Cabins, 3-way RV hookups, and tenting at a family-owned site on a 30 acre pond in Clarksville. Photos, directions, and general information. Six campsites and four housekeeping cabins, located in Moorhead. Open all year. Photos, rates, and downloadable brochure. RV park, tent camping and cabins in Pagosa Springs. Offers fishing, hunting, hiking and horseback riding. Posts rates and services. Posts information on camping, cabins, boat rental and directions. Located in Townville. Cabins and camping for travelers and horse campers. Also provides trail rides for those not bringing a horse. Rates, map, and photos. Ensuite cabins, cabins, powered and unpowered campsites, general store, and dive shop. Photos, maps, history of area, cost, and contact information. Cabins and campground, offering shaded tent camping, full RV hookups, cabins and motel units, all with cable TV. Also provide horseback riding. Offers canoe, kayak, tube and raft trips on the Mohican River. Located in Loudonville. Family-oriented holiday venue offering campsites as well as ensuite and non-ensuite cabins. Map and directions, photos, and activities. Located near Margaret River. Located in Inverness. RV park,and fishing resort by the Withlacoochee river, overnight or seasonal sites and rental cabins. Provides photos, maps and rates. Offer RV and Tent camping along with cabins, featuring fully equipped kitchens, baths, porches, picnic tables and grills. Provides services, prices and location. Log camping cabins, bathhouse, campsites with water and electric hook-ups, located in Moorestown. Photos, local activities, directions, rates, and contact information. Offer RV and Tent camping along with cabins, featuring fully equipped kitchens, baths, porches, picnic tables and grills. Provides services, prices and location. Located in Brevard. If the business hours of Smiths Pleasant Valley in may vary on holidays like Valentine’s Day, Washington’s Birthday, St. Patrick’s Day, Easter, Easter eve and Mother’s day. We display standard opening hours and price ranges in our profile site. We recommend to check out 3smiths.com for further information. 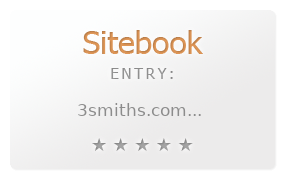 You can also search for Alternatives for 3smiths.com on our Review Site Sitebook.org All trademarks are the property of their respective owners. If we should delete this entry, please send us a short E-Mail.